My favourite video game soundtrack is not a collection of original orchestral pieces, nor tracks by famous artists. It is one performed by a band that, were it not for this game, few of you will have ever heard of. Full Throttle, an adventure title released by Lucasarts in 1995, is rightly regarded as one of the finest (and funniest, in its own dry way) games ever made. Smart puzzles, a striking visual style and dark humour punctuates the game, but what tops the whole thing off is its music. A gang of bikers roaming a post-apocalyptic wasteland needs dirty rock to accompany them, and dirty rock is exactly what they got from San Francisco band The Gone Jackals. In a somewhat unique move for the time, the developers - led by Tim Schafer and Lucasarts' composer Peter McConnell - did not rely entirely on in-house (or out-sourced) musicians for Full Throttle's soundtrack. Instead, they contacted the Jackals, a band that had been kicking around the Bay Area with various members and in various guises until in 1990 its line-up settled down and a debut album ("Out and About with the Gone Jackals") was released. Over the next nine years the band - comprised of Judd Austin (guitar), Trey Sabatelli (drums), Keith Karloff (vocals) and Rudy Maynard (bass) - would flirt between rock, metal and even blues, but it was a heavy combination of all three on 1995's "Bone To Pick" that would be their trademark release. McConnell, a Lucasarts veteran who also composed the "backing" music for Full Throttle, got in touch with the Jackals at this time and, feeling their music was a great fit for the biker culture being explored in Full Throttle, licensed the entirety of Bone To Pick for use in the game (and the game's soundtrack). 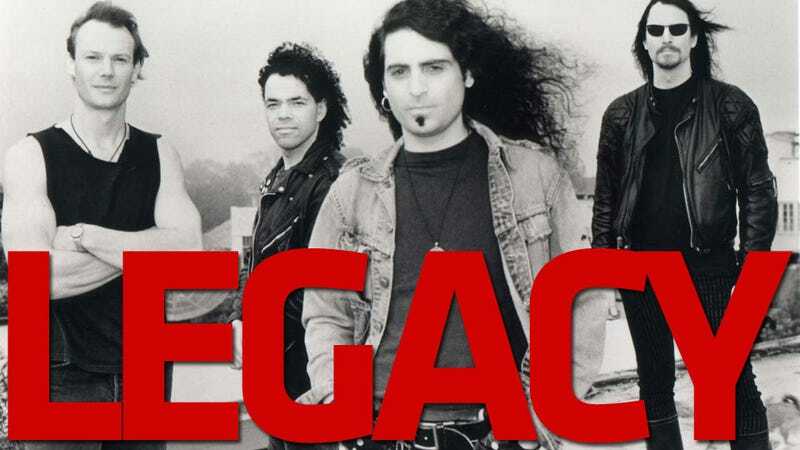 While some songs were converted to midi backing tracks, the highlight was the use of the full version of "Legacy" in the game's intro, perhaps the most badass intro ever made. Another great moment is the song "Increased Chances", which while credited to the fictitious band Chitlins, Whiskey and Skirt was actually a collaboration between McConnell and the Jackal's lead singer Keith Karloff. For a band that never really achieved mainstream success, their appearance in Full Throttle was actually the peak of their careers. The exposure gained, thanks to prominent promotion on the part of Lucasarts, helped "Bone To Pick" sell a few hundred thousand copies worldwide, which while hardly grounds for an appearance on Rock Band is still a great achievement for a small-time rock act. The Gone Jackals broke up in 1999 having never matched the success they found with Full Throttle (though Karloff continues his career to this day with The Bonedrivers). Their ancient website lives on, however, and you can visit it here.